America is home to many large airports, from John F. Kennedy in New York City to Hartsfield-Jackson in Atlanta. These airports serve as main hubs for big carriers such as United, American, Delta, and JetBlue. But with the rise of low-cost carriers, many smaller regional airports are also gaining traction. We wanted to look at some of these trends, so weâ€™ve ranked airports in the United States by a change in overall passenger numbers over a 10-year period. From this data, we also looked into some of the reasons that those that those airports are growing and declining the fastest. Passenger enplanement is a count of all revenue boarding passengers at each airport, including through passengers. The Federal Aviation Administration provides data on passenger enplanement each year. We compiled this data from 2007 through 2017 (the most recent data available) to get our 10 yearsâ€™ worth of data. We then looked at the change each year individually, and compared the change from 2007 to 2017 to get to our percentage growth (or decline). We only looked at airports that had over 3 million passengers in 2007, as this is typically the minimum threshold for medium-sized airports. 10 Fastest Growing Airports in the U.S. Airports that had more than 25% growth over the past 10 years landed a spot in the Top 10. The rapid growth of Dallas Love Field should come as no surprise. The end of the Wright Amendment in October 2014 meant airlines (and primarily Southwest Airlines) could fly to many more destinations than allowed under the previous rules. In fact, airlines have greater demand to fly from this airport than the legal limitation on their 20 gates allows! This airportâ€™s location close to downtown along with the rise of flights by Southwest Airlines have made it the fastest growing over the past 10 years. Austin is booming. Over 10 years, the growth has been phenomenal â€” and itâ€™s not expected to slow any time soon. Itâ€™s important to note that almost 12% growth came from 2016-2017 alone. At AUS, they are building more gates, though perhaps not enough to support anticipated growth. The market is mostly domestic routes, but international routes are growing at 22% year over year as well. For example, there is a nonstop British Airways flight to London, a nonstop Condor Airlines flight to Frankfurt, and even a seasonal nonstop on Scandinavian Airlines to Stockholm. New Orleans serves as a hub for Southwest Airlines. Over the past 10 years, MSY has seen a return of flights (and tourists) lost post-Katrina, but also an influx of new flights to the airport as well. There is a new terminal scheduled to open in 2019, which will add gates to accommodate expected future growth. Most of this growth is expected to come from Spirit Airlines, who have added the most capacity in the past few years. SFO served over 55.8 million passengers in 2017 alone, and it has seen 14 years of consistent passenger traffic growth. While passenger traffic has grown by almost 36%, the number of flights at SFO has only grown by 14%, which reflects SFOâ€™s â€œsmart traffic growthâ€� efforts. They encourage airlines to increase capacity by using larger aircraft wherever possible in lieu of adding more flights. San Francisco International Airport offers nonstop flights to more than 45 international cities on 39 international carriers, making it one of the top international hubs in the U.S.
Another leader for international travel is Houstonâ€™s Hobby airport. Since Southwest Airlinesâ€™ first international flight out of Houstonâ€™s Hobby Airport in 2015, its international passenger rate has skyrocketed. In 2015 alone, 76,400 international passengers went through HOU. In 2016, that number jumped to 404,600 passengers! While there has also been growth in domestic flights, itâ€™s the international flight growth that helped land Houston Hobby in the number 5 spot for growth over the past 10 years. SEA is currently investing in the airportâ€™s growth with construction projects aimed at serving more passengers and improving the travel experience; they expect to spend $3.2 billion on capital development between 2017 and 2022. In 2017, the airport broke ground on the new international arrivals facility to support the increase in international flights from new nonstop routes such as Virgin Atlantic to London, Aeromexico to Mexico City, and Aer Lingus to Dublin. Seattle-Tacoma International is also seeing a massive buildup in domestic flights by Delta and Alaska Airlines. Carriers like Southwest Airlines, Spirit Airlines, and JetBlue are building up Fort Lauderdale as the gateway to South Florida. This is mainly attractive because FLL doesnâ€™t incur the impossibly high costs of flying into Miami International. Growth from these low-cost carriers accounts for two-thirds of all passenger traffic out of FLL. Note that Fort Lauderdale-Hollywood International Airportâ€™s north runway will close from June to October 2019 for maintenance repairs. That closure is likely to mean that 1 million fewer passengers will fly through FLL until it can be reopened. Nashville has become an attractive place to visit and live. The population is rising, and it has been ranked among the top 10 U.S. real estate markets to watch for the third year in a row. While these factors increase the demand to visit, additional routes by Southwest Airlines are primarily driving growth in this market. Across all airlines, passenger enplanement was up 12% year over year for 2015-2016 and 9% from 2016-2017 â€” it appears that this trend will continue in the future. Los Angeles International is the fifth busiest airport in the world and the second busiest in the United States in 2017 in terms of passenger traffic. Los Angeles remains a popular destination for leisure and business travelers alike, and LAX has the highest number of international nonstop destinations on the West Coast. This airportâ€™s growth over the past 10 years is primarily related to these international routes, as well as an increased demand for travel to the second largest metropolitan area in the United States. Boston Logan serves as a hub for Delta Air Lines and is a focus city for JetBlue. While there has been growth in domestic markets, Boston Logan has significantly expanded its international capacity in recent years. In 2006, the airport had 26 international flights and now has 54 total. In 2018, BOS added nonstop service to Colombia and to Brazil as well. San Jose International Airport has seen increases over 15% in 2017 and increases over 10% in 2016. In the past year, the airport has added 4 new international carriers (Air Canada, Air China, British Airways, and Lufthansa), and gained additional destinations on American, Alaska, and Southwest. Due to this expansion, SJC is adding additional gates to accommodate this Silicon Valley airportâ€™s boom. Expect its growth to continue in upcoming years. 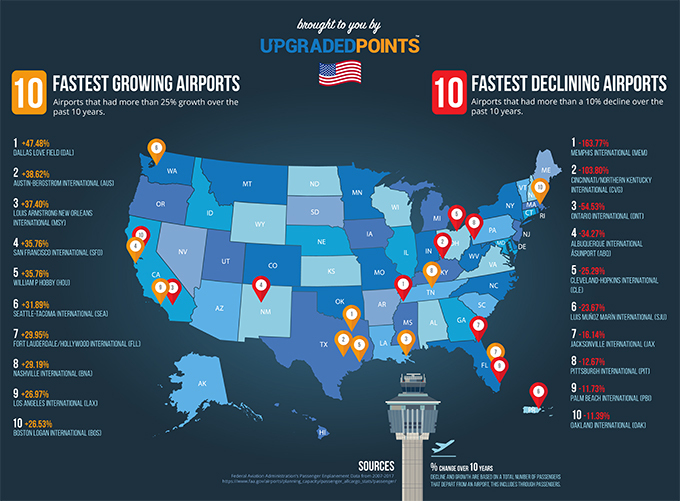 10 Fastest Declining Airports In The U.S. These airports had a greater than 10% decline over the past 10 years. Memphis is a growing region with a healthy economy. So why the dramatic decline in passengers flying out of (or through) the city? Delta decided to gradually shut down its hub at Memphis International and transfer all of those connections to Atlanta. At one time, millions of travelers would layover in Memphis before catching a flight to their final destinations. Now there are direct flights to far fewer destinations than before, and only 2 routes to international destinations. Cincinnati was also a victim of Deltaâ€™s hub reallocation. But while passengers have been moving away from Cincinnatiâ€™s airport over a 10-year trend, this has been turning around in the past few years. Southwest entered the market in June 2017 and has been the biggest driver of growth. Frontier and Allegiant are both growing as well, resulting in a very positive outlook moving forward. Overall, enplanements were up by almost 16% from 2016-2017. Airlines have reduced service to small and mid-sized airports, especially in markets where a large metro hub is nearby. This was definitely the case for Ontario International â€” even low-cost carriers like Allegiant Air have opted to operate out of LAX rather than ONT. Southern California is also an incredibly saturated market, with 7 airports in a fairly condensed area. ONT lacks many of the amenities of some of the larger airports in the area, making it a less-popular choice for the average flyer. Albuquerqueâ€™s airport was a victim of the Wright Amendmentâ€™s end. If you wanted to fly from Dallas Love Field (DAL) to anywhere in the Western United States, you had to transfer through ABQ before making your way to your final destination. With the â€œbordering statesâ€� requirement of the Wright Amendment no longer in place as of 2014, air travelers are now able to bypass the Sunport completely, leading to the decline of overall passenger traffic. Cleveland is a United hub, but Unitedâ€™s role in Cleveland has steadily been declining over the past 10 years. This means that there isnâ€™t a single dominant carrier at CLE. But there is hope â€” in 2017, passenger enplanement was up 20%! This growth is primarily thanks to added flights from the low-cost carriers (Southwest Airlines, Allegiant, and Frontier). Passenger traffic was actually on the upswing since 2012 due to increased flights from Southwest Airlines and other low-cost carriers, but it was hit hard in 2017 by Hurricane Maria. Airline mergers have impacted Jacksonville International. When Delta Air Lines fused with Northwest Airlines in 2008, so did their counters. Same with United Airlines and Continental Airlines (which merged in 2010), and Southwest Airlines and AirTran. In their place, small regional airlines have taken over the gates, but their passenger traffic has not kept up. Passenger growth had been steadily declining year over year at Pittsburgh International until 2014. However, low-cost carriers are increasing both domestic and international nonstop service, so the long-term outlook is good. Market saturation is a real problem for Palm Beach International. Passengers are choosing to drive a little further for greater choices (and lower prices) and Fort-Lauderdale or Miami International Airports. 2008 and 2009 were terrible years in terms of lost passenger traffic, but the following years have almost made up for those loses. The trend moving forward is positive, and additional domestic and international nonstop service is being added daily to Oakland International. Atlanta, Los Angeles, and Chicago are projected by the FAA to remain the 3 largest airports in the United States through 2045 in terms of passenger enplanements. Enplanements at Ft. Lauderdale, San Diego, Boston, and Newark airports are projected to grow fastest among the large hub airports. In terms of regions, the Southern region is expected to lead in passenger enplanements in 2045, while the Western Pacific region is projected to stay in second place. OAG provides digital information and applications to the worldâ€™s airlines, airports, government agencies, and travel-related service companies. Check out OAGâ€™s Report for more of their predictions on what the future holds. Itâ€™s obvious that low-cost carriers are dramatically changing the landscape of airports across the United States. In addition, the big carriers are redistributing their hubs, resulting in the big airports getting bigger. What overall impact do you think this will have on airport traffic in the United States? What airports do you see growing in the next few years? Copyright 2018 Upgraded Pointsâ„¢, LLC. All rights reserved. From https://upgradedpoints.com. By Christy Rodriguez.